The centrifuge is of compact small-footprint design for 12 x 1,5-2,0 mL microtubes with rapid acceleration and deceleration, pulse spin feature and supplied with a fixed angle rotor including adaptors for 0,2 mL microtubes. 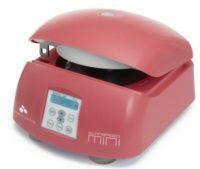 The centrifuge is recommended for molecular works of cell collection, phenol extraction, simple spin-down etc. Air cooling to minimize noise and heat generation. Quiet operation at less than 56 dB(A) allowing a comfortable laboratory environment. Supplied with autoclavable 12-place fixed angle micro-rotor, snap-fit plastic rotor lid and 12 adaptors for 0,2 mL PCR tubes. Available in three colors - white, blue and pink. The centrifuge is working at high speed with 5 acceleration and deceleration ramping speeds for sensitive samples, memory for 100 programs, auto lid release and pulse spin feature. 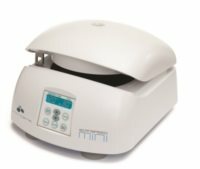 The centrifuge is recommended for molecular works of cell collection, phenol extraction, simple spin-down, filter tube separation etc. Compact design built to accommodate PCR tubes, microtubes and cryotubes (0,2 to 2,0 mL). 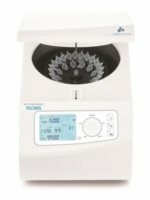 The centrifuge is working at high speed and boasts a highly intuitive and ergonomic user interface, easy and sophisticated control and full function safety architecture. Soft touch control panel and trendy touch wheel, which are highly sensitive and intuitive to input parameters. 3,5" LCD window with simultaneous display of all operational parameters of set and actual figures. A separate "PULSE" for quick spin. Key lock function secures the set parameters during operation. 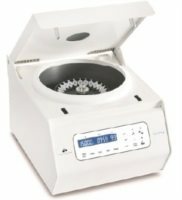 A refrigerated high-speed microcentrifuge with temperature range from -20°C to ambient. It has a fast cooling function, auto rotor identification and alarms for imbalances, overheating and overspeed. Including as well memory for 100 programs with 5 acceleration and deceleration ramps for sensitive samples. The centrifuge is recommended for molecular works of ethanol precipitation, phenol extraction, NA preparation, cell collection, spin-down of temperature sensitive reaction mixtures etc. Maximum capacity for 30 microtubes, 18 microfilter tubes or 64 PCR tubes. The "compressor-off function" when the lid is open, minimizes unnecessary cooling and frosting.